The nonprofit World Resources Institute has a new paper out today arguing that a carbon tax should include provisions that enable policy adjustments if it's not proving effective enough. Why this matters: Carbon taxes have no political traction in Congress right now. But work by WRI highlights various efforts to inform or influence policymakers if — and that's a big if! — a window opens down the line. And while the timing is coincidental, the paper arrives just after the rollout of a major new bipartisan lobbying group called Americans for Carbon Dividends that's seeking to build political momentum. On the wonk side: Others working on CO2 tax policy design include Columbia University's Center on Global Energy Policy, which launched a policy research initiative this year, and the Brookings Institution, which has long worked on the topic. An upward adjustment in the tax that kicks in. Using higher revenues, which would come from higher than desired emissions, on other programs that cut CO2. Implementing "backstop" regulations to further drive down emissions. The intrigue: Americans for Carbon Dividends is pushing a plan crafted by the affiliated Climate Leadership Council — whose leaders include James Baker and George Schultz — that phases out EPA rules alongside a tax that begins at $40 per ton and rises. But a number of environmental groups, while they may embrace carbon taxes, will push back against the idea of scuttling regulatory authorities in return, due to concerns that taxes don't ensure emissions cuts. Thought bubble: Given the massive headwinds facing U.S. carbon taxes, debating their design kind of feels like debating what to have for lunch after we colonize Saturn. But if a political window is somehow pried open in the future, backers will need their plans well defined or could miss out. Look what happened to Republicans who missed their chance to repeal the Affordable Care Act last year. Deal emerging: Saudi Arabia says OPEC ministers are nearing an agreement to boost crude production by one million barrels a day to help tame prices, the Wall Street Journal reports this morning. Wisdom from Vienna: Just a reminder that crude oil is not yogurt. State of the market: "Oil prices headed lower on Thursday, after media reports said Iran might accept a modest increase in production at this week’s OPEC summit," per MarketWatch. Aramco IPO: A number of outlets are reporting that Saudi Arabia's energy minister on Thursday appeared to suggest that the planned IPO of state oil giant Aramco, already delayed, might not even happen in 2019. "It would be nice to do it in 2019," he said, according to their story. "The timing is not critical to the government of Saudi Arabia. It does not have to happen at a certain date." State of play: When it comes to the economy, Trump's "America First" mantra has meant renegotiating existing trade treaties and imposing tariffs on imported goods such as aluminum, steel and solar panels. Because they prioritize growth, G7 leaders, free-trade proponents and most economists oppose Trump’s anti-globalized stance. Yes, but: Environmentalists and steady-state economists (i.e., those who study the physical constraints on economic growth) might secretly want to cheer. Why? More global economic activity translates to more natural resource extraction and GHG emissions, and vice versa. If you want to lower GHG emissions, tanking the economy is one way to do so. The bottom line: Trump might think he is helping the U.S. economy and workers by imposing tariffs. But by introducing these isolationist policies, he might slow globalization and therefore reduce GHG emissions — something he doesn’t care much about at all. My thought bubble: On the other hand, your Generate host feels it's important to note that the carbon effects of a global trade war are hard to gauge. Consider oil-and-gas giant Equinor's new Energy Perspectives report, which explores global energy trends through 2050 under various scenarios. In their "rivalry" scenario — a future soaked in geopolitical and trade conflict (among other elements) — emissions soar even though economic growth is hampered, thanks to a hobbled transition to low-carbon energy. LNG: A new Financial Times story provides an in-depth look at opportunities and trade-related headwinds facing plans for investments in new U.S. liquefied natural gas export projects. U.S. LNG isn't on the list of goods that energy-hungry China is hitting with new penalties in the trade fight with the White House, but the dispute is still casting a shadow. "The biggest threat to all these plans, however, is the trade dispute between the US and China. Even if US LNG exports have been spared for now, the prospect of being shut out of the world’s biggest growth market will hang over the industry until the hostilities are brought to an end," writes FT's Ed Crooks. Trade war fallout: Per Reuters, "A scheduled trip to West Virginia by executives from China Energy Investment Corp to discuss a planned $83.7 billion investment in the state has been canceled, the latest victim of a growing trade war between the United States and China." EPA saga: Via Politico, "Sen. Jim Inhofe is back in Scott Pruitt's corner after meeting with the embattled EPA chief Tuesday night — and 'a little embarrassed' to have doubted his longtime friend from Oklahoma in the first place." Screenshot of chart on the relative shares of energy sources in global electricity production, taken from BP's 2018 "Statistical Review of World Energy"
The context: Dale said that during a talk yesterday at the Atlantic Council, where he chatted about BP's recently released Statistical Review of World Energy. The chart above show how coal's share in the global power mix has remained at 38% over the last 20 years. Why it matters: He noted that electricity generation accounts for a third of global carbon emissions. Coal is the most CO2-intensive source. On the record: Dale called it the most "worrying" chart in this year's annual data report. “It’s striking because despite all this effort to reduce our reliance on coal, despite this enormous growth in renewables, we have made almost no progress in this fuel mix,” he said. 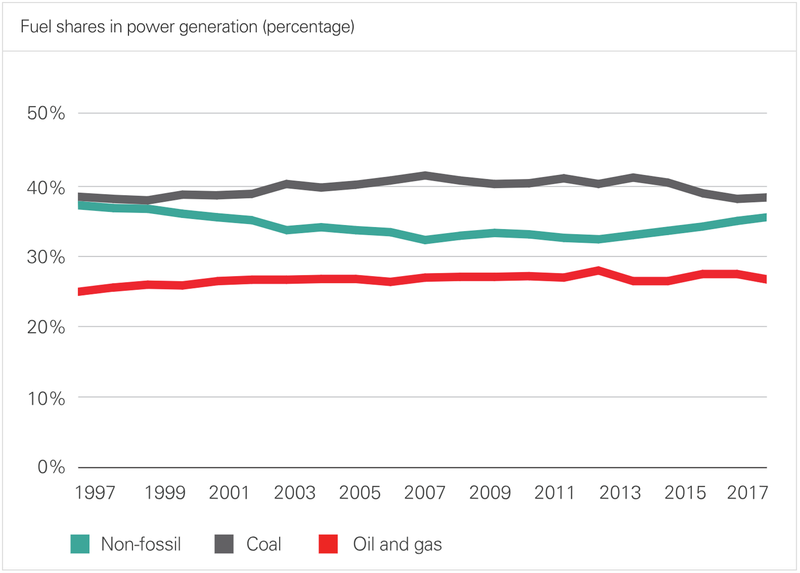 While total generation from non-hydro renewables — notably wind and solar — has soared, the total share of zero-carbon energy has been flat thanks to growing overall demand and the decline of nuclear and hydro, Dale noted. He called for pricing carbon emissions to help alter the fuel mix. Go deeper: Read my earlier story on how BP data highlights the persistence of fossil fuels. 2.37 million: As in 2.37 million barrels per day of U.S. crude oil exports, which was the U.S. average last week. That's the second-highest number ever, behind the 2.56 million barrels per day during a week in May. New normal: Of the 9 times that exports have averaged over 2 million daily barrels over a week, 8 of them have occurred this year. The surge in U.S. oil production from shale formations combined with the wide difference between WTI and Brent prices makes the U.S. crude attractive to international buyers. Plus, global crude demand is rising.